Check out our Letter Y book list! 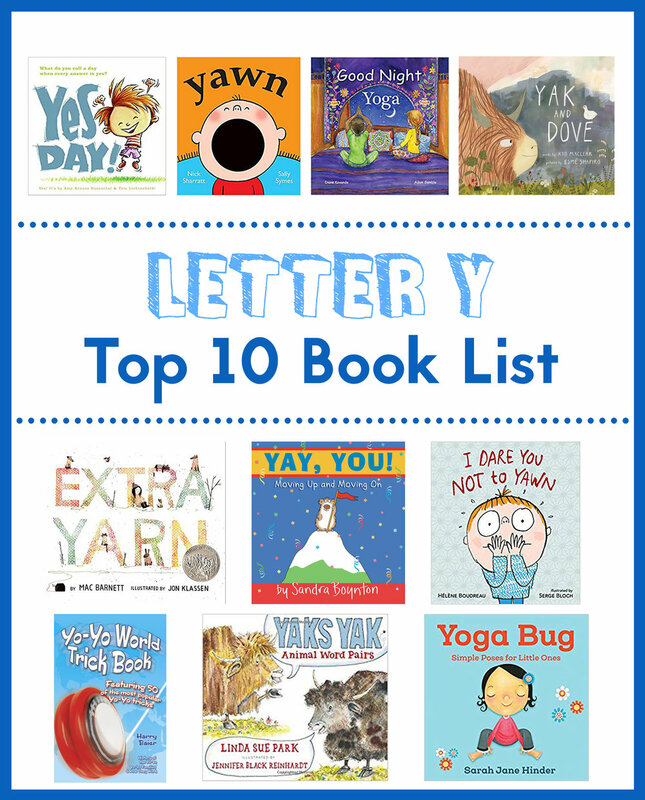 We’ve included 10 great books, including fiction and nonfiction, to reinforce your child’s love of the Letter Y! This story illustrates various yoga poses to last from morning to night-time. It encourages children to try the movements as well, with questions like “Can you make a triangle shape, stretching your body?” Along with the many poses, from stretching like a cat to imitating a cow, making a bridge, and twisting in a pretzel, it reminds readers to concentrate on careful and intentional breathing that calms and soothes. We love its inclusion of healthy movement while also encouraging reading, making it a great choice when learning about the letter Y! Extra Yarn begins in a cold little town, where all one can see is white snow and black chimney soot. A little girl named Annabelle soon discovers a box of colorful yarn, so she begins to knit. She starts with a sweater for herself, then she makes one for her dog, too. With more and more leftover yarn, she creates more and more projects. That is, until the archduke realizes the magic of the never-ending yarn box and attempts to steal it! Readers will enjoy how the story unfolds, as well as the transition from muted illustrations to more and more color as Annabelle completes her yarn projects. A beautiful book that all readers will adore! Good luck resisting a yawn while you read this book! In Yawn, a boy passes his yawn to a cat, who gives it to a bird, who gives it to a fish, and so on. With a clever cut-out circle that becomes the mouth of each yawning creature, your little ones will love guessing who comes next! This is a great book to read when learning about the letter Y! Oh, Sandra Boynton, how we love you! With its simple upbeat message, combined with Boynton’s adorable animal illustrations and funny text, Yay, You! acknowledges that all people are different, and no matter what they like, where they live, or what they choose to do, the last two lines of text remind us, “I know you’ll be great. You already are.” This is not only a great book to read when learning about the letter Y—it’s a great selection for a recent graduate or anyone experiencing significant life changes. Don’t you yawn! Don’t do it! After all, if a yawn “pops out,” terrible things might happen, like getting sent to bed! Not only that, but yawns are contagious— watch out! Little ones will love this fun and engaging book, and come on, who can resist a good dare? Yak and Dove wish they were twins, plant a garden, and more, all while recognizing their similarities and differences. The book is organized into three sections, similar to acts in a play, and all are written in back and forth dialogue between Yak and Dove. With beautiful illustrations in watercolor, gouache and colored pencil, this is a gorgeous book young readers (and adults) will love! A hilarious nonfiction book? Yes, please! 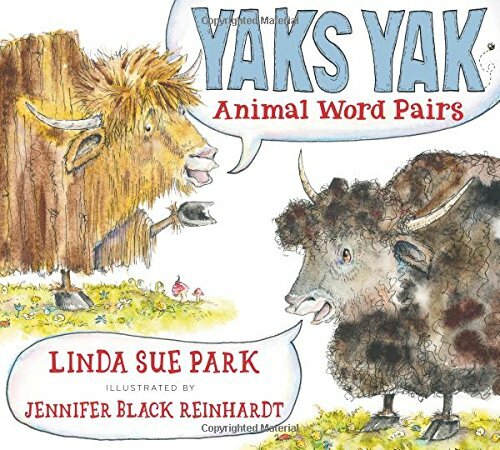 Using funny animal word pairs, Yaks Yak presents homographs, or words that are spelled and pronounced the same, but hold different meanings. Thanks to matching illustrations and definitions on each page, readers will grasp a deeper understanding of these fun phrases. With eighteen total animal-action homograph word pairs, there are plenty of silly word pairs and illustrations to enjoy! Included at the end is a useful guide with a chart of “The Words” used in the story, the animals’ names and likely origins, and the origins and meanings of each action word. All these reasons make it a great book to read for the letter Y! This nonfiction book is all about yo-yos! As stated in the preface, the purpose of this book is “to popularize the Yo-Yo and put an end to its time in the shadows.” Claiming that Yo-Yos make for a great stress reliever for kids AND adults, this book is packed full of cool tricks! The book begins with a brief history of the Yo-Yo, a brief explanation of the different types of Yo-Yos, and helpful trick tips like changing the string and adjusting its length. Then come the tricks! Each trick has its own name, step-by-step instructions and matching illustrations for each step, making it easy to follow and understand. With over 10 basic tricks, picture tricks, and over 25 pro tricks, this book will have your kids (and you!) yo-yo-ing in no time! This adorable book features tons of cool creatures and matching yoga poses! Available in both classic and board book format, your little ones can try all sorts of fun “bug” poses with simple directions. We love that each bug has a colorful illustration and an illustration of a child showcasing the matching yoga pose. It even includes a bonus “Yoga Bug Flow” at the end with all the poses in a suggested flow. There is no shortage of fun and engaging moves for your little ones to try! We hope you’ve enjoyed our top 10 books for the Letter Y! For more letter-themed ideas, including letter-themed crafts, snacks, and activities, check out our letter blog posts, like the Letter Y post. And don’t forget to subscribe, so you can be the first to see our future letter book lists!! Check out our Letter N book list! We’ve included 10 great books, including fiction and nonfiction, to reinforce your child’s love of the Letter N! 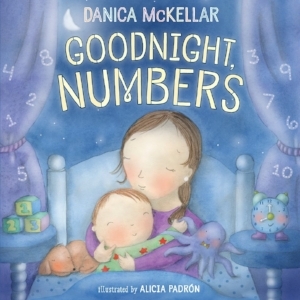 Goodnight, Numbers illustrates families as they wind down with their little ones and ultimately snuggle into bed and fall asleep. Each page includes a number, the corresponding number word, and a cute poem, highlighting each number in order with real-world objects. The book also includes a special author’s note from Danica McKellar herself, encouraging parents to help children see math as “friendly and relevant in their lives.” She even suggests real-life ways to incorporate math into a child’s life—at the grocery store, bedtime, or while cooking! There’s even a special page entitled “How to Get the Most Out of Goodnight, Numbers” with 5 helpful tips for extending learning. We think this is a great book to learn about rhymes, numbers, and the letter N! This clever book stars a very noisy apartment building that poses the question, “What is going la la la above my head?” Each turn of a page moves up a floor, with a new noisy scene and sound, such as “ma, ma, ma” or “cha cha cha.” Each group wonders what the noise is above their heads, until finally the top floor is revealed! Noisy Night is a fun repetitive text, full of rhymes and sound words, making it the perfect noisy book to read with the letter N! Night Animals is a hilarious story about night animals scared of other night animals. Jump into the story with a raccoon, possum, wolf, and bear, as their paranoia inspires all sorts of shenanigans. This book is full of funny text, illustrations, and dialogue, and it’s a great book to read with the letter N! Reminiscent of the children’s song “Five Little Monkeys,” this book features gobs of fun characters, including all sorts of beloved kid favorites—10 little ninjas, 9 tiny astronauts, 8 rapid racers, you get the picture. Your child will be sure to find a character they love! And to match these diverse characters are colorful illustrations for each number. As the story unfolds, it counts backwards from 10, providing extra practice with numbers. 10 Little Ninjas is a great sleepy time bedtime story that’s fun enough to be read anytime! This adorable story follows a unicorn named Kelp, who was born deep in the ocean amongst a pod of narwhals. Though he realizes he is a bit different, he tries his best to fit in. Then he sees something that looks like him ashore! After swimming slowly to land, he searches for the mysterious creature, which he’s dubbed a “land narwhal.” But once he find them, should he join his fellow creatures on land or remain in the sea? 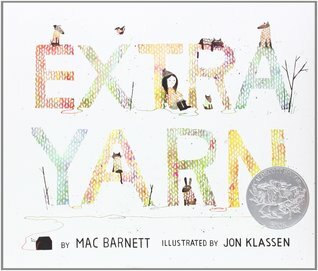 This is a great book that talks about being different and fitting in, and come on—who can resist narwhals and unicorns? A spin-off of “The House That Jack Built,” this fun story features all sorts of woodland creatures as they help Robin build her nest. The repeating text gradually builds, which makes it a great read-aloud. It even includes a fold-out page revealing all the things Robin did to build the nest for her eggs. 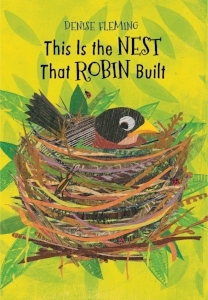 Not only is it engaging, the book is also very informative, teaching children how a robin builds a nest with content-related vocabulary. Overall, this is a great choice to read with the letter N! If you haven’t read The Book With No Pictures, it is a must-read! As the warning on the back cover reads, “This book looks serious, but is actually COMPLETELY RIDICULOUS!” Make sure to read it aloud—it’s a book that your kids will ask to read again and again! Narwhal is a fabulous nonfiction introduction to these mysterious creatures. Readers will learn about narwhal behavior, habitat, traits, and more! And it provides a great introduction to nonfiction text features. It even includes a labeled narwhal body map! How cool is that?! This is a great way to explore more about narwhals and the letter N! A Nest is Noisy is a beautifully-written and illustrated text showcasing unique features of various nests. From a tiny hummingbird to a flamingo, a prairie dog, crocodile, orangutan and more, this book teaches children about all kinds of creatures and their nests. While the book can be read straight through as a poetic story, each page also includes smaller text with added detail about each animal and their particular nest. Inside the front and back covers there is even a a picture-glossary of sorts, with 24 different types of nests and the 24 creatures that live in those nests. Children will learn so much from this book! This is a really, really great counting book! It counts from 1-20, but it also counts by 10s to one hundred, and it even includes a page of 1000! Numbers is full of color as your child counts legs, wheels, plants, cakes, birthday candles, bananas, and so much more! What a great choice for the letter N! 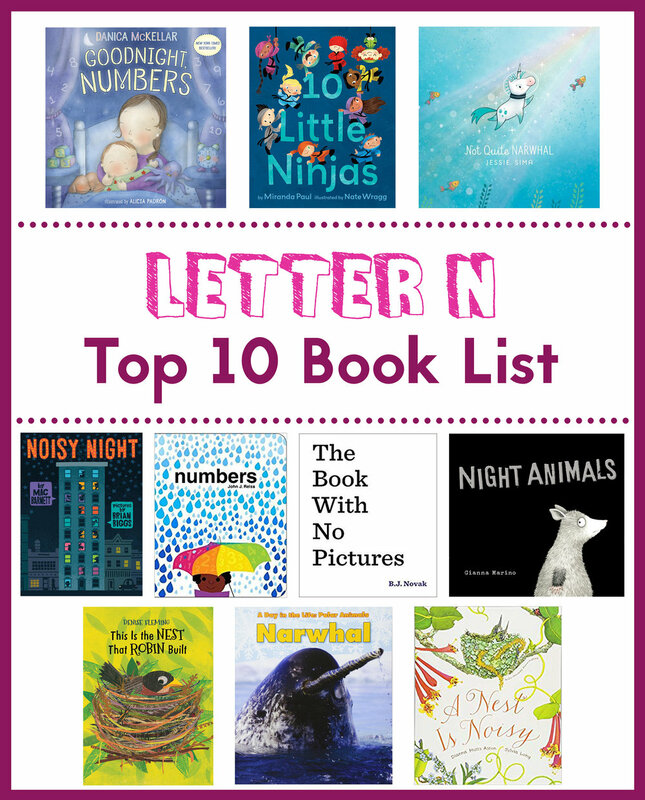 We hope you’ve enjoyed our top 10 books for the Letter N! For more letter-themed ideas, including letter-themed crafts, snacks, and activities, check out our letter blog posts, like the Letter N post. And don’t forget to subscribe, so you can be the first to see our future letter book lists!! Check out our Letter E book list! We’ve included 10 great books, including fiction and nonfiction, to reinforce your child’s love of the Letter E! Following the text to the well-known children’s song, “Do Your Ears Hang Low?”, this book highlights the ears of adorable creatures, from a bloodhound to a llama, rabbit, and piglet. There are also cool and interesting “ear” facts included at the end, not to mention a mirror, so readers can see themselves and their own wonderful ears! Do Your Ears Hang Low? is a fabulous book to sing or read when learning about the letter E! The Little Engine that Could is a classic story about a happy little train full of “good things for boys and girls.” But when her engine breaks, she can’t travel over the mountain to deliver her goodies to the children. The little train tries to flag down help from a Shiny New Engine, a big Passenger Engine, and a Freight Engine, all of whom are quite capable, but much too busy and important to help. Finally, a little blue engine chugs by the poor broken engine, and although the blue engine is quite small herself and has never travelled over the mountain, she takes the job, tugging and pulling and repeating to herself, “I think I can- I think i can!” A great book that teaches about kindness, helping others, the power of positive thinking, and, of course, the letter E! The Ear Book by Al Perkins showcases all of the wonderful sounds our ears can hear! With oodles of sound words like ding, dong, boom, tap, clap, and more, this book is a really fun read. And it reminds us to appreciate our ears and all the sounds they hear, all while learning about the letter E! Elephants Cannot Dance! follows Elephant and Piggie, two friends who always have fun and share hilarious adventures. In this story, Piggie tries to convince Gerald the Elephant to dance with her, but “Elephants cannot dance!” he declares! Piggie encourages him to try by showing him lots of dance moves. This leads to plenty of giggles as Gerald attempts to go forward, backward, up and down, spin, stop, wiggle-waggle, and robot walk, to name a few. This read encourages us to try new things, overcome disappointment and struggles, and simply have fun! Grandma Tildy lived all alone. So when she was repeatedly approached by a door-to-door salesman selling pets, she often agreed, while declaring, “But no elephants!” However, when winter approaches, the salesman takes off and leaves an elephant behind, despite Grandma Tildy’s requests. The elephant and Grandma Tildy find themselves in a funny and troubling predicament, and readers will delight in the twists in this story! With a great pattern to the text, But No Elephants is also fun to read aloud in class or at home. It’s an alphabet emergency! One morning in the alphabet house, letter E came down the stairs too fast and ended up in the ER with instructions for rest and recuperation. But how can E rest? Who will take her place in the alphabet? Read about all the comical things that happen when O tries to fill in for E. With lots of witty text and dialogue, language, and a ton of alphabet letters, this story will be sure to entertain while providing terrific alphabet practice along the way! In beautiful pastel illustrations, watch three eggs hatch and encourage the fourth egg to do the same. Then, when it finally hatches, the fourth egg reveals a surprise! With minimal, strategic text, and lots of repeating words and phrases, this book is an excellent choice for beginning readers. With over 80 color photographs, this book will captivate its readers! It begins with a fun elephant rhyming poem, then continues with plenty of information about elephants. Chapters are organized into chapter sections, including categories like “Trunks, Tusks, and Tails; Family and Friends; From Dawn to Dusk; and Elephants and Humans. With each category organized and separated into smaller chunks, young readers can follow along more easily. Plus, organized chapters help moms pick which and how much information to explore with their little ones. Overall, this is a wonderful book to add to your letter E nonfiction collection! In this engaging look at Earth, planet Earth is personified as a talking planet which teaches kids about itself (and the solar system) in an easy-to understand, story-like format. Referring to himself as “Planet Awesome,” the Earth gives an historical overview that both kids and adults will appreciate. Although written like a story, Earth! My First 4.54 Billion Years still includes many nonfiction features, like diagrams that showcase the Earth’s crust, mantle, inner and outer core. Finally, the author includes a special note at the end, addressed “Dear Alien Visitors.” There she writes, “I’ve made every attempt to bring you an accurate, brief (and entertaining) history of the planet Earth,” claiming she is an expert “since I’ve lived here my entire life.” This is a fabulous twist on a traditional nonfiction book, and we think you and your little ones will love it! Organized into five main chapters, The Bald Eagle includes a table of contents, as well as sections such as True Statistics, Resources, Important Words, and an About the Author section. It is full of beautiful photographs, and kids may particularly enjoy seeing how big a bald eagle’s wingspan actually is, complete with illustrations to compare it to a 43” child, crow, and seagull! This book not only includes interesting facts about bald eagles— readers will also learn how these birds are connected to US history and military. We love the “A True Book” series for its content, information, and kid-friendly text and layout, and this book makes a great choice for the letter E! We hope you’ve enjoyed our top 10 books for the Letter E! For more letter-themed ideas, including letter-themed crafts, snacks, and activities, check out our letter blog posts, like the Letter E post. And don’t forget to subscribe, so you can be the first to see our future letter book lists!! Check out our Letter W book list! We’ve included 10 great books, including fiction and nonfiction, to reinforce your child’s love of the Letter W! This story follows a bunny family that comes home to find a bundle outside their door. When they peek inside, they find it’s a baby wolf! While the bunny parents love the little wolf right away, sister Dot is not so accepting. She is convinced “He’s going to eat us all up!” This wonderful story includes “sibling rivalry, bravery, unconditional love...and veggies!” With Zachariah Ohora’s beautiful illustrations as an added bonus, this is a book your little ones will adore! In What Will Hatch? children can interact with the simple text and make lots of guesses! Each page includes a two-word description, such as “sandy ball,” a gorgeous illustration of eggs in their natural setting, and the titular question: “What will hatch?” With a flip of a page, readers will see which animal or creature was hidden inside the egg! Although the book itself is fiction, it still helps to teach children about oviparous animals (animals who lay eggs) and includes 8 creatures to guess. At the end, there’s a special section about each animal, with a short description for each that includes the length of time spent in an egg, where they lay eggs, and how many siblings they may have. On the last page, there’s even an illustration of “Chicken Egg Development,” complete with a peek inside eggs on days 1, 7, 14, and 21. Overall, this is a great book for little ones to learn more about eggs and take an active role in their reading or listening! This beloved children’s story follows Max and his big imagination—an imagination which gets him in trouble and sent to his room without any supper. But in his room, Max travels further into his imagination until he arrives at a faraway place—where the wild things are. There, he becomes “king of all wild things,” participates in a “wild rumpus,” and has plenty of fun and adventures until he’s ready to return home. The poetic language and beautiful illustrations make Where the Wild Things Are a timeless classic. Greg Pizzoli’s debut picture book is hilarious and delightful! It is about a cute little crocodile who absolutely loves watermelon. All is well, until he accidentally swallows a seed! Your children will enjoy the crocodile’s hilarious antics as he ponders all the awful things that might happen to him! This book also includes adorable illustrations—it’s a great choice to read with your little ones for the letter W! Wanna know what worm life is really like? Worm describes his surprisingly relatable life as he goes to school, plays with his friends, wakes up from a bad dream, and so much more! The text is simple but clever, full of funny situations your little ones will love! Although this book is a work of fiction, it may give your little ones a better appreciation for worms and all the good they do for the earth! 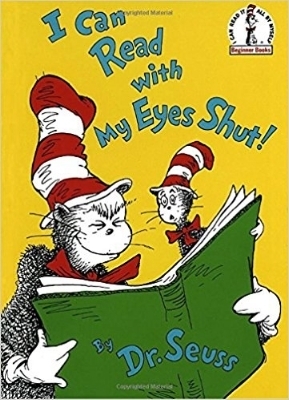 Who doesn’t love Dr. Seuss and his crazy rhymes? There’s a Wocket in my Pocket is packed with all sorts of interesting creatures and made-up animals, from a Wasket, to a Zelf, Vug, and dozens more. This is a fun book to read aloud and will instigate plenty of silliness and laughter! It may even inspire your child to make up their own rhyming creatures! Snail and Worm tells three stories about Snail and Worm, two small but adorable best friends who always find a way to have a good time! Their antics are quite comical —things like confusing a dog with a spider or playing tag with a stick will put smiles on your kids’ faces as they enjoy their silly adventures! The stories are short and simple, and the stories can all be easily read in one sitting or spaced into three. This National Geographic Reader is organized into ten main chapters. It includes a short quiz at the end and a picture glossary featuring 11 content-related words, their definitions, and a photograph or picture to go with each. It’s a level 3 reader, so while your child may not be able to read this book on their own, with the help of an adult, they will be able to learn so much about how amazing and important water is! Chapters touch on a wide variety of information, from the water cycle, to conservation, how water and the weather are related, solids, liquids, and gases, ocean currents, clouds, and more. Your child will be amazed to see how much of the world around them is affected by water! National Geographic Readers: Great Migrations Whales features the largest toothed predator in the world: the sperm whale! These creatures aren’t only huge, they are also fascinating! In ten chapters, readers will learn all about these massive creatures, including their size, body parts, where they travel in the world (complete with a map! ), their food, babies, and more. There’s even a special section at the end that helps readers find ways to take action, either by helping whales specifically or helping control pollution. And with a picture glossary featuring ten whale-related vocabulary words, your children will be exposed to new and exciting vocabulary, too! Check this one out! This is a great nonfiction text that reads like a story as it tells about a Pacific mother walrus who gives birth to a baby in the spring. As the story is told, readers will learn all about the life of a walrus, including their habitat, their bodies, and how they hunt. Each page also includes additional walrus facts. The beautiful illustrations, walrus habitat map, “Walrus Fun Facts” section, glossary, index, “More Books to Read” section, and internet sites make this book a fantastic choice when learning about the letter W! We hope you’ve enjoyed our top 10 books for the Letter W! For more letter-themed ideas, including letter-themed crafts, snacks, and activities, check out our letter blog posts, like the Letter W post. And don’t forget to subscribe, so you can be the first to see our future letter book lists!! Check out our Letter D book list! We’ve included 10 great books, including fiction and nonfiction, to reinforce your child’s love of the Letter D! Who doesn’t love dragons… and tacos?! Featuring a boy and his dog and lots and lots of taco-loving dragons, this story teaches readers all about what to do when it comes to both dragons and tacos, and, well, taco parties for dragons! Readers will truly enjoy the hilarious taco party-mix up, and the fiery result of the boy’s errors! Overall, a clever story that is fun both to read and listen to! When Dinah hatches out of her egg, she quickly discovers there is much to see and do in the world around her. And when she sees two dinos kissing, she decides she wants to try that, too! However, Dinah soon realizes it’s not as easy as it looks. After plenty of whomping, chomping, stomping, and even accidentally eating, she finally figures out how to give a dinosaur kiss. A hilarious story with lots of action words and cute illustrations, we think you’ll love this one for letter D! Based on a book he wrote when he was a child that consisted entirely of the words “no” and “David,” author David Shannon wrote No, David! as a means of “celebrating those familiar variations of the universal ‘no’ that we all hear while growing up.” Throughout this book, David gets into lots and lots of trouble by doing things like tracking mud in the house, running through the streets naked, playing with his food, breaking things, playing ball in the house, and so much more! Children will love David’s mischievous ways and will be grateful they aren’t the ones in trouble! 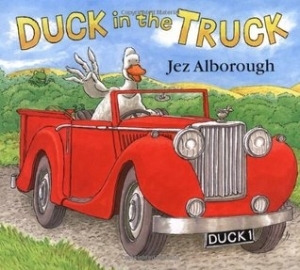 In this story, a duck in a truck gets stuck in the muck! Luckily, he finds animals who are willing to help, and the story follows their adventures as they try to get him unstuck! This book has plenty of rhymes, repetitive text, and an unexpected ending, making it a fun read-aloud book. And because Duck’s character is not always kind or polite, his antics can spark a great discussion on how to treat others! How Do Dinosaurs Go to Sleep? is a funny book that many children can relate to, as the dinosaurs do all sorts of comical things to get out of going to bed, including hiding in the closet and begging for more stories. But the dinosaurs do lots of traditional things, too, like taking a bath before bed, brushing their teeth, and snuggling into bed! This book has plenty of rhyming words, fun illustrations, and lots of dinosaurs! It’s the perfect book for dinosaur lovers, those in need of a bedtime story, or kids learning about the letter D.
We love the “If You Give a….” series and the Numeroff-Bond author-illustrator match-up. In If You Give a Dog a Donut, you’ll learn all about what will happen if you give a dog a donut, including apple picking, playing ball, playing pirates, and many more fun adventures! Children will love the repetitive feel to the text, silly dog actions , and learning about the letter D.
This is a really BIG book filled with even bigger dinos! Longer than most of our National Geographic book recommendations, this book is organized by small dinosaurs, big dinosaurs, giant dinosaurs, and even gigantic dinosaurs! It includes a dinosaur map, glossary, and an index. It even has a helpful Parent Tips section that includes 12 different ways to extend your child’s learning. On each page, readers will find a large colorful illustration of the featured dinosaur, a fact sheet that includes when it lived, its food, its size relative to humans, and a “say my name” guide in easy-to-pronounce words/syllables (particularly helpful to parents or caregivers reading this book aloud!). It also includes several paragraphs of interesting facts for each dino. 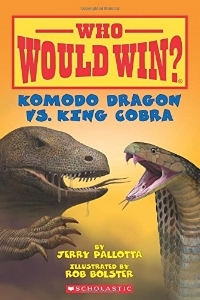 Even though it includes over 50 dinosaurs, it is still written in kid-friendly language so kids can learn and understand all about these unique creatures! Looking for an interactive book? You’ve come to the right place! Dog is full of flaps to open, things to touch and pull, dogs that wag their tails, shake their heads, scratch, and even a dog who lifts his leg to pee! Things to touch include sticky icky dog tongues, fluffy fur, and more. 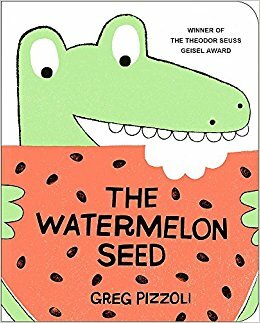 The text includes plenty of rhymes, descriptive words, and opposites, so there are plenty of opportunities for learning. At the end, there’s even a section that gives the name and breed of every dog featured in the book. Combined with tons of amazing photographs, children will enjoy all they can read, see, and do with this clever book! Yay! A nonfiction book intended for beginner readers! Simple text and explanations help young readers easily grasp new dolphin-related content and vocabulary. Large photographs also fill the pages for kids to enjoy. Although there is no table of contents, the book is organized by short chapters, such as “Splash,” “Chow Time,” “Oh, Baby,” and several others. Each chapter is informative without being overwhelming, with no more than 4 sentences per page! The “Explore My World” series makes a great beginning nonfiction series, and Dolphins is a perfect way to learn more about the letter D! We hope you’ve enjoyed our top 10 books for the Letter D! For more letter-themed ideas, including letter-themed crafts, snacks, and activities, check out our letter blog posts, like the Letter D post. And don’t forget to subscribe, so you can be the first to see our future letter book lists!! Check out our Letter H book list! We’ve included 10 great books, including fiction and nonfiction, to reinforce your child’s love of the Letter H! Old Hat, New Hat is a perfect book for new readers, thanks to its minimal text, lots of repeating words, and simple phrases. And who can resist the Berenstain Bears characters? In this book, one such bear is in search of the perfect hat. Readers will enjoy his many hilarious attempts to snag the right one. Oh! And there’s a fun surprise ending to boot. Thanks to the many description words, Old Hat, New Hat will also help children learn and practice vocabulary while using the letter H! Another great book for beginning readers, Hop on Pop is full of simple text, rhymes, and repeating words and phrases with classic Dr. Seuss silliness. Pages feature words/phrases like “ALL FALL” in bold at the top, followed by a short sentence including those words, such as “All fall off the wall.” In this way, budding readers can first identify the words, and then practice reading them! Whether your little one is ready to read or needs you to read to them, this is a wonderful choice they will enjoy! In Hug Machine, a little boy calls himself “The Hug Machine,” due to his mad hugging skills. He uses his hugs to calm people down, cheer them up, and “make them go completely nuts!” And he doesn’t stop at hugging people. He’ll hug anything he sees, including a fire hydrant, a park bench, and a tree! Full of love and lots and lots and lots of hugs, nothing is too big, too small, or even too spiky for the Hug Machine! This is a great story about kindness and love, and of course, a fabulous choice for the letter H! Honey… Honey… Lion! is an African tale featuring the partnership of two animals: the honeyguide bird and the honey badger. According to the story, “the little bird follows a bee to its hive, and then she leads the honey badger there to break it open with its big strong claws. Together they share the sweetness.” That is, until the badger decides he will no longer share with the tiny honeyguide. So the honeyguide, angry and hungry, decides to play a trick on the honey badger. Due to the intriguing story and gorgeous illustrations, children will delight in this fun tale, as the honey badger learns an important lesson! This book is easy to love, whether or not you’re a fan of bears (or hats!). A bear has lost his hat and wants it back. In I Want My Hat Back, the bear approaches creature after creature, asking if they’ve seen his hat. After seven animals and zero luck, he realizes that he has, in fact, seen his own hat! As he dashes to confront the thief, readers will enjoy his clever pauses and skips… and they’ll get to make their own conclusions at the end of the story! A cute little hippo baby finds that he is the smallest in his family. In fact, he’s the smallest animal around, and despite his mother’s gentle reminders that he will be big someday, he does not want to wait! “I want to be big right now!” he exclaims. But all that changes when he gets the chance to help someone smaller than he is. With great lessons on perspective and how we are never too small to help, this is a wonderful choice for the letter H! 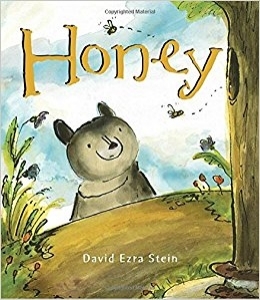 Honey is a companion book to David Ezra Stein’s Leaves, complete with the same loveable bear. This year, Bear is desperate for some delicious honey, but when he realizes it is not quite ready to eat, he must find ways to entertain and distract himself from the warm, sticky stuff he craves. With simple but beautiful text, lots of descriptive words and language, and beautifully illustrated pages, readers will enjoy following this bear’s adventures (and may end up craving toast with honey themselves)! The deadliest African mammal is no lion or crocodile—it’s a hippo! This and plenty of other facts about this humongous creature are shared in Hippos Are Huge! Readers will learn about hippos’ size, ability to “dance” underwater, how they hunt, eat, and even poop. As for text features, important words are highlighted in bold, with an index in the back to help readers find the most important words. Other text is presented in a slightly smaller, narrower font, cluing in the reader that the author has included more detail on the subject if they want to learn more! With colorful and detailed illustrations showcasing these mighty animals, your perspectives just might shift regarding the massive beasts. Speaking of text features, Horses includes a table of contents with 8 chapters devoted to horses. It also includes sections such as Words to Know, Read More, and Websites, not to mention an index and a section at the end that includes a diagram of a horse’s anatomy. This nonfiction text is great for beginning readers, because the words are simple and kid-friendly, often with only a few sentences per page. The photographs are colorful and bright and showcase a variety of horses, from draft horses to ponies. Horses is a perfect book for the letter H! High-Flying Helicopters is another great machine book by the Tony Milton and Ant Parker duo. 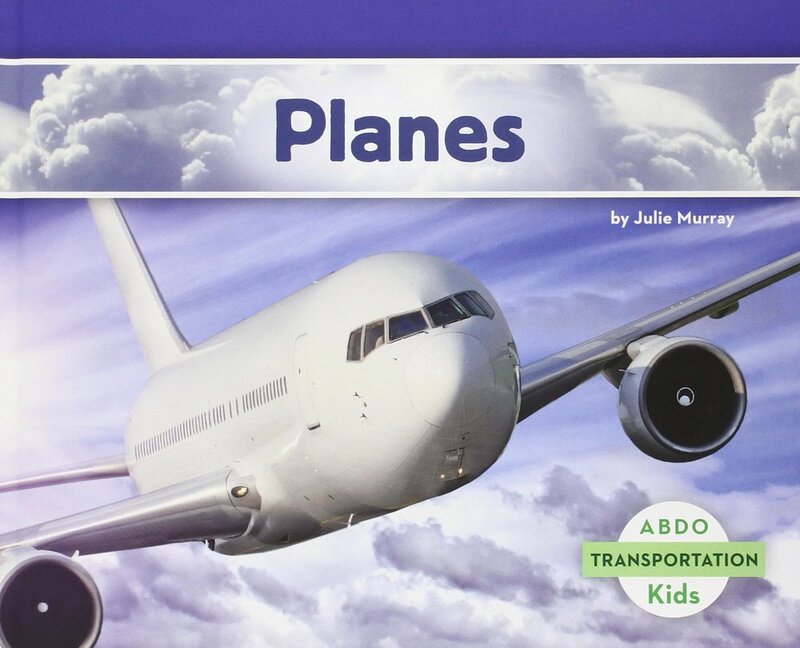 In this book, readers will learn all about these cool flying machines through plenty of illustrations and fun animal characters. And, as in the rest of the series, the text is simple, engaging, full of rhymes and tons of information! There’s even a picture dictionary at the end where readers can learn about specific helicopter parts. Check it out! We hope you’ve enjoyed our top 10 books for the Letter H! For more letter-themed ideas, including letter-themed crafts, snacks, and activities, check out our letter blog posts, like the Letter H post. And don’t forget to subscribe, so you can be the first to see our future letter book lists!! 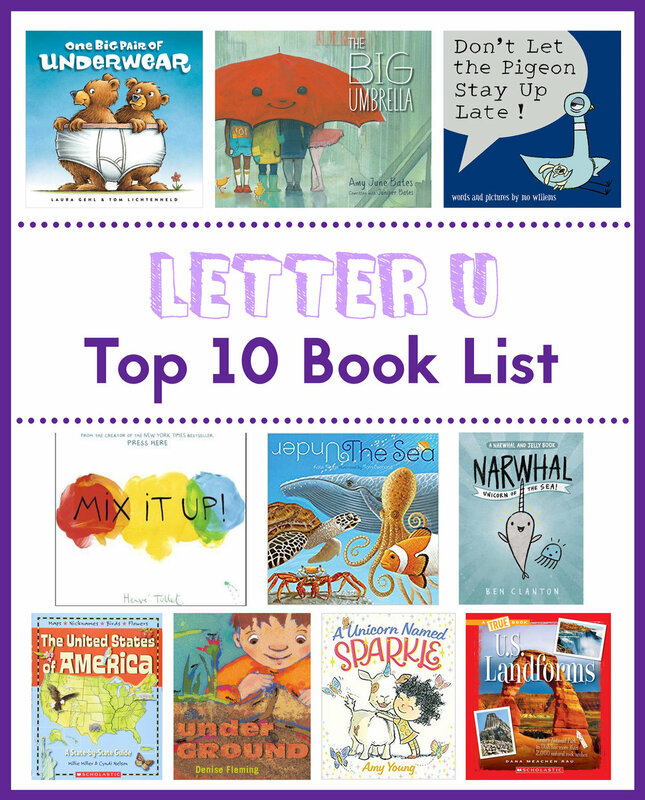 Check out our Letter U book list! We’ve included 10 great books, including fiction and nonfiction, to reinforce your child’s love of the Letter U! A Unicorn Named Sparkle is a story about a little girl named Lucy who sees an ad for a 25¢ unicorn. She sends in her money, happily dreaming of the day she will meet her unicorn! But when Sparkle eventually arrives, he is not quite what Lucy expected. Not only does he not look the way she expected, but he smells funny, has fleas, eats underwear, and sends them on all sorts of other comical adventures! This is a funny story of acceptance, friendship, and love—a book your children will adore! Mo Willems is just plain hilarious. Similar in theme to Don’t Let the Pigeon Drive The Bus, in this story, readers are counseled, “Don’t let the pigeon stay up late!” The pigeon, of course, does not exactly comply with this request, instead giving every excuse possible! Kids may be able to see themselves in this funny pigeon as he tries to dodge bedtime. We especially love the interactive tone of this book, as the pigeon seems to talk directly to the reader. Overall, this is a wonderful and hilarious book your children will love! Speaking of interactive books, in Mix It Up!, readers are asked to do such things as “tap that gray spot” on the page or “mix it up” by mixing different colors together, providing lots of practice in following directions. Children will learn all sorts of lessons about colors, too, as they see that it only takes a few basic colors to make a whole beautiful rainbow of paint! This is a great book to help children follow directions, learn about color, and, of course, practice the letter U! Under Ground is a beautiful and easy read, full of gorgeous, detailed illustrations, simple text, and lots of rhymes. The illustrations feature a unique process called pulp painting, a paper-making technique “using colored cotton fiber paper poured through hand-cut stencils.” There is plenty for your little ones to see as they read about the animals that live and spend time underground. At the end, there’s even a “Creature Identification” page that features 21 different creatures, along with an illustration of each with their name and a short description. Overall, this is perfect for learning about the letter U! Not all umbrellas are inanimate. The big umbrella, for example, is a “big friendly umbrella” that “likes to help.” It’s quite adorable, actually, with its big, happy smile. Its story shares the many kinds of people and creatures that take shelter beneath it, and readers will soon realize there is no limit to its kindness. The short and simple text makes this a quick but beautiful read, one we think your little ones will love! 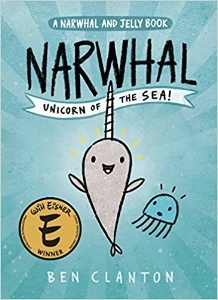 This graphic novel is full of fun pictures, hilarious text, and a very animated (not to mention uber-cute) narwhal! It includes a table of contents and is organized into 5 chapters with fun chapter headings like “Narwhal is really awesome.” It even includes fun facts and a song! With lots of unexpected surprises, including waffles, robots, a joke-telling sea monkey, and plenty of other crazy adventures, this book will be sure to entertain and get some laughs, too! This counting book also teaches a lesson about sharing. It begins with one pair of underwear and two bears who aren’t particularly fond of sharing. The story increases in number by one with each turn of the page, adding new characters but never enough supplies, making it difficult for each group of animals to share! By the end, animals are doing all sorts of hilarious things—cows are riding jet skis, ducks are playing ice hockey, and seals are driving scooters, so there is no shortage of quirky fun. It’s also full of rhymes, hilarious pictures, and lots of counting, making this is a great book for the letter U—and for those who need some extra lessons about sharing! U.S. Landforms is organized into 5 major chapters, with various smaller sections at the end, including true statistics, resources, important words, an index, and a section about the author. Readers will begin by learning about the types of landforms in the U.S., from borderlines to peninsulas, mountains to plateaus. Each section has very cool pictures that will help expose your little ones to all of the beauty that can be found in the U.S. While the text is a bit long for many young readers, its structure makes it easy to pick and choose topics of interest or split it up into several readings. A great choice for the letter U! In Under the Sea, your little one will see and read about a clownfish in an anemone and an octopus in a den, not to mention a jellyfish, sea turtle, crab, whale, and even seaweed! The illustrations include plenty of detail, showcasing the amazing life that lies under the sea. And with only one sentence per page, it’s a perfect beginning nonfiction book—simple, yet educational! Want to practice the letter U and learn geography at the same time? Look no further! This book begins with a large map of the United States of America. Then each state is featured on its own page in alphabetical order. Not only does it include all 50 states, but it also includes pages for Washington, D.C. and Puerto Rico! Each page is stuffed with interesting facts about the state, including an illustration of the state and its major cities, the state capitol, and other major points of interest, such as rivers, mountain ranges, lakes, and more. But that’s not all. The pages also include each state’s official flower, tree, insect, and bird, as well as fun facts about the state and/or its history. There is much to learn from this informative book, and children will get a taste of the diversity within the United States of America! We hope you’ve enjoyed our top 10 books for the Letter U! For more letter-themed ideas, including letter-themed crafts, snacks, and activities, check out our letter blog posts, like the Letter U post. And don’t forget to subscribe, so you can be the first to see our future letter book lists!! Check out our Letter J book list! We’ve included 10 great books, including fiction and nonfiction, to reinforce your child’s love of the Letter J! Bruce Degen’s Jamberry makes such a fun read-aloud! Inspired by the author’s experience as a young boy picking berries, the story follows a boy and a bear in all sorts of fun berry adventures. The text itself is jam-packed (pun intended!) with rhymes, nonsense words, and lots and lots of berries—both real (blueberries, strawberries, blackberries and more) and imaginary (“clickety-clackberries,” “quackberries”). With beautiful illustrations of the boy and bear in all sorts of mischief, this is a delicious choice for the letter J! Stuff sheep in a Jeep, and you’re sure to have some crazy travels! Told in minimal words, this fast-paced story includes lots of rhymes and silly illustrations. It’s not only a great quick-read, it’s perfect for the letter J! If You Were a Jelly Bean is an interactive book that you and your child can enjoy together. Readers not only learn about animals and colors, they also get to know each other as they pick out their favorite colors, toys, and more! Readers even get to complete sentences, such as, “If you were a jelly bean, you would be a….” This book includes lots of colorful and bright illustrations, making it a fun choice for the letter J! This fun pattern book starts with a frog and ends with a giant whale! Each page follows the same pattern, changing each animal for a bigger one. Since the text is patterned and predictable, your little ones will quickly learn when to yell, “JUMP!” Full of rhymes, animals, and lots of jumping, this is a great book. As can be seen, Peanut Butter and Jellyfishes is truly “a very silly alphabet book!” The illustrations are bright, colorful, and loaded with all sorts of interesting things, from “ice cream the size of an igloo” to an “ostrich with oats by oodles.” The book follows the traditional alphabet, with each letter getting its own page (or two!). Children will love all the clever (and very silly!) things that go with each letter! The last page includes a bunch of balloons with each letter of the alphabet represented, providing yet another way to review letter sounds or letter names with your little ones. This book is a fabulous and fun way to study letters and their sounds! 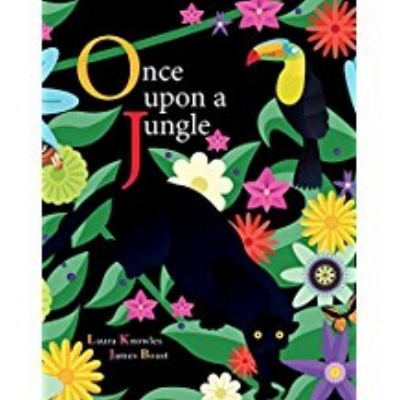 Once Upon a Jungle tells the story of the circle of life in simple, poetic language and colorful illustrations. With only a few words per page, readers will learn how the circle of life supports the jungle ecosystem. Starting with tiny ants, which are preyed upon by the mantis, which is hunted by the lizard, and so forth, the ecosystem circles back to teach readers not only about the food chain, but about life in general. It concludes with a special two-page foldout featuring other life found in the jungle. This is a beautiful book young readers will “circle” back to again and again! This retelling of the classic tale is complete with all the beloved characters of the original, including Jack, the beanstalk, and a child-eating giant who yells, “Fee-fi-fo-fum!” The story follows Jack as he trades his cow for magic beans, which beans lead him to unbelievable adventures when they grow into a giant beanstalk! With bright and colorful illustrations, this is an easy read that will introduce your children to this classic story. Want to mesmerize your little ones? Look no further! Dan Kainen has captured eight fascinating jungle creatures using a method called photicular, which makes the photographs appear to move! In the book, a butterfly flaps its wings, a monkey scratches its back, a spider crawls across the floor, and more! 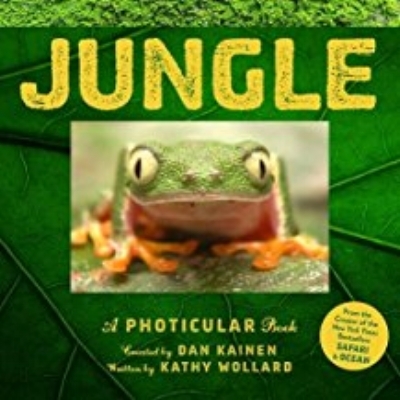 Along with these fascinating photographs, the book also includes several pages about jungles in general, not to mention a page dedicated to information about each animal, their behavior, habitat, diet, and more! This will be a book your little ones will hate to finish! The Read and Learn series book Jellyfish, by Louise Spilsbury, is a great nonfiction choice for young readers! With nine main chapters organized into headings posed as questions, readers will learn what a jellyfish is, how they reproduce, what they look like, eat, hunt, and more! Each page includes a fascinating photograph, often with labels that help explain the meaning of content-related vocabulary. Such vocabulary is interspersed throughout the text and can also be found defined in the glossary. The book also includes a jellyfish body map, picture glossary, index, and a Find Out More section. Check it out! Another great Read and Learn book, Jaguars introduces readers to these powerful cats in a chapter format. Such chapters detail what jaguars eat, how they sleep, how they care for their young, and more! The text is easy to understand and includes a photograph on every page. This is a great nonfiction book for the letter J and Jaguars! 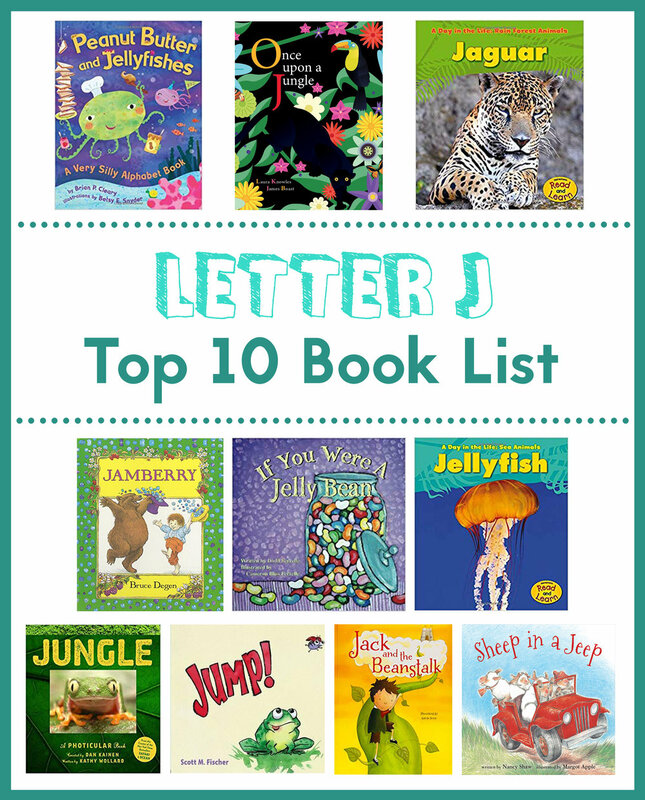 We hope you’ve enjoyed our top 10 books for the Letter J! For more letter-themed ideas, including letter-themed crafts, snacks, and activities, check out our letter blog posts, like the Letter J post. And don’t forget to subscribe, so you can be the first to see our future letter book lists!! Check out our Letter L book list! We’ve included 10 great books, including fiction and nonfiction, to reinforce your child’s love of the Letter L! 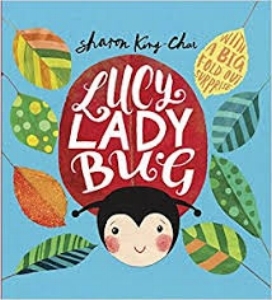 Lucy LadyBug is all about Lucy, a ladybug with no spots! Cast out by the other ladybugs, Lucy visits with many other spotted animals, including a frog, caterpillar, fish, and bird. As they chat, she wishes she could be just like them, and in turn, they each give her one of their spots. Despite their help, Lucy ultimately realizes that being different isn’t such a bad thing after all. Lucy LadyBug is very colorful and a beautifully illustrated book, with a huge open-up surprise page at the end. Use this book to learn about colors, animals, counting, and especially the letter L! In yet another adorable Llama Llama story, Llama Llama wakes up and gets ready for a brand new day! With simple and fun lyrical rhyming text and sweet illustrations, young readers will enjoy and relate to this cute llama and his mama. Also available in board book format, this is a story your little one will read again and again! In Lost and Found, a boy is greeted by a penguin on his doorstep. Realizing that the penguin must be lost, the boy takes off on an adventure to figure out where the penguin came from and how to get him back home. This is a great story about helping others, friendships, and the letter L! Need a cuddly warm-fuzzies book? Check out this sweet story. I Love You Through and Through expresses all of things we love about those close to us. From “your giggles and cries” to “your inside and outside,” your children will enjoy all of the opposites and sense the love you feel for every bit of them! Complete with darling pictures, colorful illustrations, and sweet and simple text, this is a perfect quick read when learning about the letter L! In Leaves, a young bear experiences his first fall. Everything seems in order until a leaf falls from a tree, and then another, and another! This concerns the bear, who grows alarmed for the poor leaves—are they all right? David Ezra Stein tells the bear’s story in both word and illustration. With simple text, readers will enjoy following this lovable bear as he experiences Fall, Winter, and finally Spring! Kids can literally count on this book, with its 10 raised ladybugs! The story begins with 10 little ladybugs, but they disappear, one-by-one, with each turn of the page. Ten Little Ladybugs is full of rhymes and lyrical text, making it a great read-aloud choice. And each page not only includes ladybugs, but also another animal, such as a duck, fish, bee, or turtle. Use it to reinforce counting, counting backwards from 10, and of course, the letter L! Lulu is “Ladybug Girl!” But not at first. After breakfast, her brother runs off to play baseball and refuses to let her come along, and Mama and Papa have housework to do. Stumped and lonely, she stares at her room full of toys and declares, “There’s nothing to do!” Finally, Lulu discovers ways to use her imagination to adventure with her dog, Bingo. That’s when Ladybug Girl is born. This is a fun read and a great reminder that you’re never “too little” to do big things! What a great book! Zoom in on Ladybugs includes a table of contents, words to know, simple text, and lots of cool photographs of—that’s right—ladybugs! It also includes diagrams, like the parts of a ladybug and the life cycle of a ladybug, along with lots and lots of unique facts. This book really does “zoom in” on these cool creatures! The National Geographic Kids series makes great books for kids who want to learn about a specific topic—in this case, lions! This one is a Level One reader, so young readers may soon be reading sections of this book on their own. Children will learn about lions’ size relative to humans, the differences between males and females, where lions live in the world (complete with a map! ), their behavior, and so much more! With lots of interesting photographs, including a picture glossary, and tons of fascinating lion facts, your little ones will be sure to enjoy this book! As mentioned, we love the National Geographic Kids series! Lizards is a Level Two book, which means more text and more challenging words. It makes a great choice for a read-aloud, as it is packed full of different types of lizards, cool facts and interesting details. And, of course, lots and lots of amazing photographs: lizards in flight, underwater, and climbing walls, to name a few. Children will enjoy all this book has to offer! We hope you’ve enjoyed our top 10 books for the Letter L! For more letter-themed ideas, including letter-themed crafts, snacks, and activities, check out our letter blog posts, like the Letter L post. And don’t forget to subscribe, so you can be the first to see our future letter book lists!! Check out our Letter G book list! We’ve included 10 great books, including fiction and nonfiction, to reinforce your child’s love of the Letter G! This has been one of our children’s favorite bedtime stories since they were very young! A zookeeper checks on each of his animals before bed. But as he does so, the gorilla quietly steals each of the zookeeper’s keys and creeps behind him to unlock each door. An animal parade then follows the oblivious zookeeper home, resulting in a hilarious situation! Your children will giggle all the way through this funny story because they know something the zookeeper doesn’t! 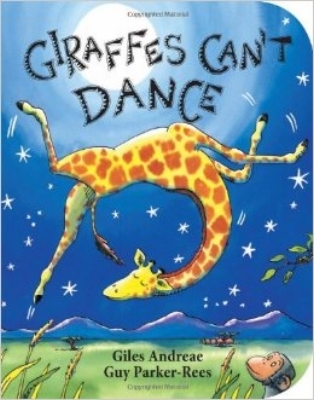 Gerald the Giraffe really, really wants to dance. But each time he tries, the rest of the jungle animals mock his efforts. After a particularly embarrassing jungle dance, a tiny cricket finds Gerald alone and offers him advice, through which Gerald learns it’s not so much the dancing that matters, but finding “music that we love.” Gerald’s character will charm your children, and thanks to the rhyming text and consistent rhythm, it just may become your next favorite read-aloud. Perhaps one of the most famous bedtime stories of all time, Goodnight Moon is a lovely way to end a day with the kids. The text is simple and almost lyrical with plenty of rhymes, making it a wonderful book to read aloud. In it, readers examine the “great green room” and all of its interesting details, including a telephone, a red balloon, two little kittens, and even a bowl full of mush. 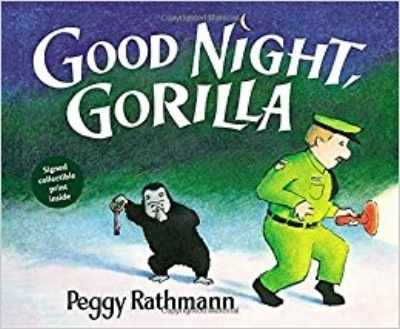 Then the book shifts, and each item is again named, this time with the precursor “Good night.” The book includes alternating black and white and color illustrations. It’s no wonder it’s been around for decades! In Shel Silverstein’s classic tale, a tree and a boy adore each other as the boy plays in its leaves and swings in its branches. Yet as the boy grows older, his needs change. Still, the loyal tree provides all it can for the boy, offering shade, apples, branches, and finally, a stump to rest upon. The Giving Tree offers a thoughtful perspective on life and its inevitable changes. In this retelling of the classic fairy tale, Goldilocks is no longer the sweet, innocent girl of the original story. This time, she’s a bit naughty and not much of a listener when her parents tell her what to do. While they will already know the general storyline, children will still love the hilarious changes, quirky dialogue, and of course, the colorful illustrations! This is a great read-aloud while learning about the letter G! When Farmer Brown goes on vacation, he leaves his brother in charge of the animals. Farmer Brown gives detailed instructions about the animals and warns his brother to keep close watch on that troublesome duck, who always seems to be carrying around a pencil. Children will enjoy Duck’s hilarious antics and pranks as Bob the Brother completes the instructions, like ordering the animals pizza and popping popcorn for movie night. And as always, there’s a clever storyline, complete with plenty of animal sound words! This clever bedtime tale details what happens as things wind down for the night on a construction site. Each page includes beautifully illustrated trucks, cranes, cement mixers, bulldozers, and more. With lots of rhyme, lyrical text, and the repeating pattern of “Shh….goodnight, Bulldozer, goodnight,” this is a perfect wind-down story or bedtime read-aloud. National Geographic Readers always seem to make our top 10 lists, and for good reason! 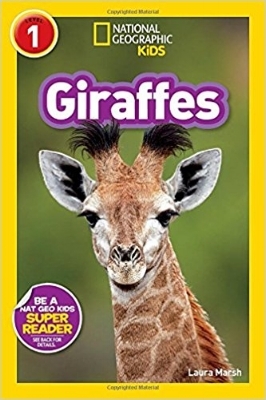 With engaging photographs, cool facts, and simple, easy-to-read text, Giraffes is a fabulous letter G choice. Organized by chapters, readers will learn about giraffes’ large bodies, where they live, how they eat, and so much more! The text introduces new content-related vocabulary, with words like hooves, plains, and predator. Then it not only explains what they mean, but includes them in a picture glossary at the end. There are even giraffe-related jokes interspersed throughout! Overall, this is a great choice while learning about the letter G.
Did you know there are more than 7,000 types of grasshoppers in the world? That’s just one amazing fact you will learn from Creepy Creatures: Grasshoppers. With lots of up-close views of these fascinating insects, readers will be exposed to grasshopper details they’d rarely see otherwise. They’ll learn all about their life cycle, their bodies, where they live, the process of laying eggs and how they hatch, and more! There’s even a cute grasshopper craft at the end, along with a glossary, index, “Read More” section and even some kid-friendly websites for kids to explore. This fascinating read details the true story of Ivan, a.k.a. The Shopping Mall Gorilla. While Ivan was born in the jungle, he was taken and then raised in a 14x14 cement shopping mall enclosure for nearly 27 years of his life. Readers will quickly fall in love with Ivan, a gentle, loving, finger-painting creature. 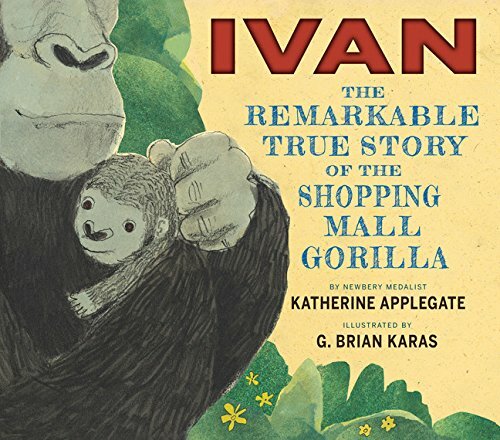 The story includes not only beautiful illustrations, but also several actual photographs of Ivan at the end, along with a more detailed section, “About Ivan.” This is a touching story and a reminder of both the needs of animals and our responsibility to protect and advocate for those needs. We hope you’ve enjoyed our top 10 books for the Letter G! For more letter-themed ideas, including letter-themed crafts, snacks, and activities, check out our letter blog posts, like the Letter G post. And don’t forget to subscribe, so you can be the first to see our future letter book lists!! Check out our Letter O book list! We’ve included 10 great books, including fiction and nonfiction, to reinforce your child’s love of the Letter O! After Owl is all tucked in and ready to sleep, he hears a tiny squeak. Assuming it’s someone at the door, he gets out of bed to check. But no one is there! He decides it must be the wind and heads back to bed, only to hear the tiny squeak again! The story continues until finally Owl figures out to whom that squeak belongs. Children will enjoy all the comical things Owl tries as he attempts to get some sleep. And all will enjoy the delightful illustrations! Orange Fish, Green Fish teaches about opposites with the help of two adorable rock fish. The story follows them on their opposite-full adventures! Each opposite is illustrated using Orange Fish and Green Fish, providing a fun way to aid your little one’s understanding. With simple text and oodles of opposites, this book is also a great choice for reading aloud. Not surprisingly, this picture book by Ringo Starr is based on the classic Beatles song by the same name. A little boy dreams of an underwater adventure “in an octopus’s garden in the shade.” The story follows him on his adventures as he and his friends explore the octopus garden, ride sea turtles, read books, and find treasure! Illustrator Ben Cort brings to song to life with colorful illustrations. Some editions of the book come with a CD read aloud by Ringo Starr himself, which includes a new recording of the song! Check it out—it’s a great book, whether or not you ever owned a Beatles album! You just can’t go wrong with a Sandra Boynton book. Opposites includes a large variety of opposite words, complete with Boynton’s iconic illustrations. For example, “HEAVY and LIGHT” are depicted in the cover photo. On the page itself, the “HEAVY” text is bigger and bolder than the thin, small “LIGHT” text. Children and adults will enjoy the silly pictures and creative scenarios, all while learning about opposites and the letter O! Olivia is a darling little pig who is “good at lots of things,” but most especially, wearing people out! In the course of a day, she goes from moving the cat to brush her teeth, to making several wardrobe changes, to painting where she’s not be supposed to, and she’s just getting started. Children will enjoy this adorable and very busy pig, and may even relate to her hilarious antics! With cute illustrations that are primarily grayscale with bold red accents and occasional pops of color, this is a story the whole family will enjoy! We love this book! It’s so clever! Beautiful Oops! encourages readers to see beyond a spill or a mess for the endless possibilities it can become! Pages include spills, rips, folds, tears, and lots and lots of mistakes, all with clever possibilities as to what these mistakes can actually become. With lots of pages to turn, flip up, pull down, open, and more, there are no shortages of surprises and interesting details, making this a fun and interactive read! It is truly a book to be celebrated, as it provides us with the perfect reminder that each “oops” can become a beautiful and wonderful surprise! Baby owls Sarah, Percy, and Bill wake up one night to find their mother is gone! While they wait and hope for their mother to come back, they do their best to be brave and wait patiently. Owl Babies includes beautiful, detailed illustrations of the owls and their environment. Overall, this charming book is a sweet reminder for your little ones that mommies will, indeed, come back! There’s so much in this book! First of all, Octopuses One to Ten offers the option of reading a shorter, quick story and learning 10 quick facts, or, for children with longer attention spans, each page also includes a bonus paragraph with a more detailed explanation of the initial quick fact. Next, the author has included 10 types of octopuses to learn about, featuring their name, an illustration, and a short description about each. In addition to the beautiful illustrations, there is also a page of octopus crafts and suggestions for two octopus treats! This book is a great nonfiction choice, packed full of material and ideas to extend the text! Owls is a fabulous book to support early readers! With simple text and child-friendly language, along with corresponding images, readers are guided to learn new words and vocabulary, as well as lots of cool and interesting owl facts! The book also includes a table of contents, complete with several chapters, a glossary, a “read more” section, suggested internet sites, and even an index. The book even includes a map of all the many places owls can live! After reading Owls, children will know where owls live, how and what they eat, their behavior, and much more! National Geographic Readers provide the perfect introduction to nonfiction for young readers, as they are packed full of colorful photographs, interesting and engaging text, and child-friendly language. In this book about sea otters, readers will learn all about what a sea otter is, where they live, how they live, their diet, their bodies, and more. There are even fun jokes interspersed to make readers giggle. With a table of contents, picture glossary, and even a fun picture identification quiz at the end, your child will learn tons of cool and interesting facts about sea otters! We hope you’ve enjoyed our top 10 books for the Letter O! For more letter-themed ideas, including letter-themed crafts, snacks, and activities, check out our letter blog posts, like the Letter O post. And don’t forget to subscribe, so you can be the first to see our future letter book lists!! Check out our Letter B book list! We’ve included 10 great books, including fiction and nonfiction, to reinforce your child’s love of the Letter B! This sweet book follows a momma fox and her two little ones. 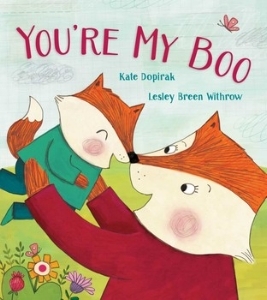 It is packed with funny words and sweet endearments like “bug-a-boo,” “sneak-a-boo,” and our personal favorite, “pumpkin doodle cake.” You’re My Boo also has plenty of rhymes and lots of opposite words. Filled with beautiful illustrations, this is a great book to read when you want to share your silly and sweet love for your little one! 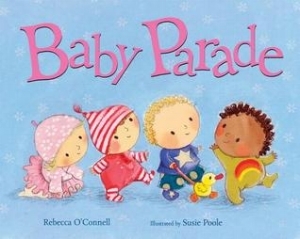 Baby Parade is about (you guessed it!) babies in a parade. Structured in the form of a pattern, the text encourages its readers to “wave to the baby…” while each time sharing a different baby, description, and color. This is a fun book, especially when learning about colors, verbs, and especially the letter B! 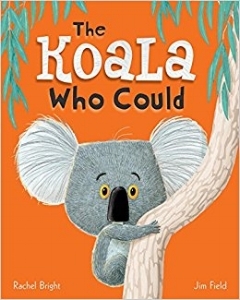 Sandra Boynton’s books are always full of fun animal characters and engaging text! In The Going to Bed Book, animals wear pajamas, exercise, brush their teeth, and more. The many rhymes make it a quick read-aloud, one that even parents won’t mind reading again and again! We’re Going on a Bear Hunt follows five siblings who decide to go on a bear hunt. Along the way, they adventure through long, wavy grass, a river, mud, and more until they finally reach the bear cave! Your little ones will enjoy the fun pattern and rhythm to the text. They may even be able to “read” along! There are also plenty of onomatopoeias (sound words) to read and say. With alternating black & white and color illustrations, this is a really fun read-(and sometimes act!)-aloud. Baby Brains begins by listing all of the things Mr. and Mrs. Brains did while they waited for Baby Brains to be born. They are thrilled for the arrival of their little one...who, it turns out, is quite unique - a true Baby Brains! He reads the newspaper, fixes the car, and wants to go to school! Your children will love all of Baby Brains’s adventures and will delight in the humorous ending! Little Buckley and his mama live close to the ocean. “They didn’t have much.” the story reads, “but they always had each other.” Buckley loves to make things, especially boats out of driftwood he finds on the beach. Each boat he makes is more beautiful than the last, and he decides to send them out to the ocean with a note for his Papa, whom he misses very much. This is such a loving story of a kind and caring mama and her tender son. It’s worth every minute of the quick read. 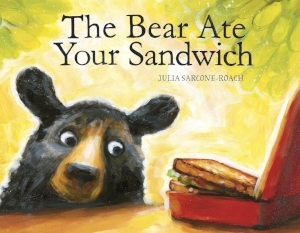 The Bear Ate Your Sandwich explains exactly how the bear ate your sandwich. His hungry tummy and great sense of smell lead him on some interesting adventures, all of which lead him to eating your sandwich! Not only is it funny, but the narrator-reveal at the end creates a clever and humorous surprise! This is a beautifully illustrated story is a great book to read with the letter B! Bears (The Most Endangered:True Books) is organized into 4 major chapters: “Keeping Bears Safe,” “Majestic Mammals,” “Under Threat,” and “A Chance to Change the Story.” Each chapter includes smaller sub-chapters to further organize the information. There are even additional sections about bear statistics, as well important words, resources, an index, and more! Not only will readers learn about these amazing creatures, but there are also tons of photographs! Not only that, but after reading this book, readers will also have a much greater understanding of what it means to be endangered and ways they can help. Check it out! Although The Beetle Book features illustrations, rather than photographs, of beetles, their detail, color, and meticulous design is seriously impressive! Each page not only showcases a variety of beetles in up-close and enlarged detail, but also includes a shadow form of each beetle so readers can see their actual size. The text discusses what makes a beetle, includes all of its many parts, and highlights special features in a wide variety of beetles, among many other topics. Whether or not you’re a beetle fan, The Beetle Book is a great read to practice the letter B sound! Looking for a hilarious book about that will still leave you stuffed with information? You found it! In Give Bees a Chance, Edgar, the narrator’s best friend, loves all the same things as the narrator (except bees!). Throughout the story, Edgar shares fascinating bee facts in an attempt to lure Edgar into sharing his passion for bees. With Illustrations including various types of bees, an anatomy of a bee, and how honey is made, combined with enough awesome facts to wow both bee-lovers and bee-haters alike. After reading this book, even the most avid bee-hater might be willing to Give Bees a Chance. We hope you’ve enjoyed our top 10 books for the Letter B! For more letter-themed ideas, including letter-themed crafts, snacks, and activities, check out our letter blog posts, like the Letter B post. And don’t forget to subscribe, so you can be the first to see our future letter book lists!! Check out our Letter P book list! We’ve included 10 great books, including fiction and nonfiction, to reinforce your child’s love of the Letter P! This is a hilarious story about a penguin with way too many problems! He suffers from everything—his beak is cold, the water is too salty, and he can’t fly, for starters. He eventually meets a walrus who offers wise suggestions for overcoming his multitude of problems. This book makes kids giggle as it teaches to show appreciation and gratitude despite challenges. If You Were a Penguin begins by asking readers, “If you were a penguin, what would you do?” Then, with beautiful illustrations and simple text, it proceeds to share many of the fun things penguins can do! For kids who want to learn more, there’s also a “Penguin Fun Facts” page included at the end of the book. This is a quick read your child will be sure to enjoy when learning about the letter P! In Pinkalicious, a little girl’s obsession with pink goes a little haywire. After eating way too many pink cupcakes, she wakes up to discover she has turned PINK! While she’s ecstatic about the change, her parents aren’t so happy and drag her to see the doctor, whose diagnosis is not what our pink-loving friend wants to hear. Not only is this a fun book to read with the letter P, it’s also a great resource if you’re studying the color pink! If you haven’t heard of Mo Willems yet, get yourself a copy of Don’t Let the Pigeon Drive the Bus and read it. Then check out The Pigeon Wants a Puppy. You won’t regret it! In The Pigeon Wants a Puppy, the Pigeon is back, and this time he’s trying to convince the reader that he should have a puppy! With tons of dialogue and funny text, not to mention oodles of expression, this book is a fantastic read-aloud choice that will have your children laughing out loud! Laura Numeroff shows up on our top 10 lists again and again because her books are cute and fun and there are so many of them! In this story, If You Give a Pig a Pancake, a pig receives a stack of pancakes. But if you give a pig a pancake, it won’t end there. You’ll end up giving him syrup, a bath, a trip to the farm, and then you’ll get mixed up in a whole truckload of funny shenanigans! This book is a great choice for the letter P! Any other parents out there desperately trying to teach their kids manners? We’ve got the book for you! As the title implies, Time to Say “Please!” gives plenty of examples of times to say please. But it also teaches other helpful phrases, such as “excuse me” and “sorry.” Plus, it reminds kids that saying “please” doesn’t always guarantee they’ll get what they want! And in classic Mo Willems style, the text is often presented in unique formats, with each word in a sign or words in a balloon, for example. Learning manners has never been so fun! Panda Bear, Panda Bear, What Do You See? by Bill Martin Jr. If you or your child have ever read (and fallen in love with) Brown Bear, Brown Bear, What Do You See?, give this book a try. While the pattern and rhyme is similar, Panda Bear, Panda Bear, What Do You See? introduces readers to a whole new cast of ten endangered animals, including a panda bear, spider monkey, sea lion, and red wolf, among others. There’s even a short note in some editions, discussing endangered animals and what we can do to help. And as always, Eric Carle’s illustrations steal the show! This is a darling book that you and your child will enjoy reading again and again. The Explore My World National Geographic series provides a fabulous introduction to nonfiction texts. While they lack some nonfiction features like a table of contents and a glossary, each book is still packed with interesting facts, beautiful photographs, and lots to learn—in this case, about penguins! The book is organized by chapters, with fun chapter headings like “Waddle” and “Glurp!” and it ends with a penguin map which showcases several types of penguins and where they live in the world. It’s a great nonfiction text to read during your study of the letter P! The National Geographic Readers series is a bit more advanced than the previously mentioned Explore My World series, primarily because there is quite a bit more text, more advanced vocabulary, and each page includes more detail. However, the books can still be used with even the youngest readers, as the reader or child can pick and choose those things most interesting to them. These books are complete with a table of contents, gorgeous photographs, diagrams, tons of science and content-related vocabulary words and definitions, a glossary, and in this case, two pages dedicated to amazing panda facts! Your children will enjoy learning about baby pandas, a panda’s diet, where pandas live, and so much more. With only two sentences per page, Planes is a great quick read. The text is really child-friendly, making it an ideal book to read aloud. It also includes a table of contents, chapter headings like “Parts of a Plane” and “Airports,” a glossary, and an index. With tons of photographs of airports, the insides and outsides of planes, and pilots, children will have plenty to look at and enjoy! We hope you’ve enjoyed our top 10 books for the Letter P! For more letter-themed ideas, including letter-themed crafts, snacks, and activities, check out our letter blog posts, like the Letter P post. And don’t forget to subscribe, so you can be the first to see our future letter book lists!! Check out our Letter I book list! We’ve included 10 great books, including fiction and nonfiction, to reinforce your child’s love of the Letter I! In Du Iz Tak, two damselflies discover a tiny shoot sprouting up from the ground. As the shoot grows, more and more characters emerge, and each decides what they could do with the shoot. This is a fun read-aloud, especially since the words are made-up. But with the help of the beautiful illustrations, the pseudo-language becomes easy to understand. A companion book to Freight Train, Inside Freight Train takes readers inside each car of the train they’ve come to love. With little “doors” that open to expose what’s hidden inside each train car, your children will love being actively involved in this book! Not only that, but this is a great book for learning colors, thanks to the red caboose, orange tank car, black steam engine, and more! While Inside Freight Train is also available in a more traditional book form that does not include the sliding door format, we recommend the active version that allows your children to “open” the train and discover all of the wonderful things hiding within! With simple and repetitive text, Inside Outside Upside Down is a great early reader choice. Using the classic Berenstain bears characters, the book takes readers through Brother Bear’s adventures as he explores a box, “Inside, outside, upside down!” It’s a quick read, one your little one could soon be reading on her own. This is the sweet story (literally) of Wemberly, a mouse who gets an ice-cream star as a special treat on a hot day. But what about her stuffed bunny, Petal? How will Wemberley get an ice cream star for him? Readers will enjoy discovering Wemberly’s solution to this problem. The book is written in very simple text, making it quick and easy to read. With adorable illustrations, a theme of sharing, and ice cream, we had to include it on our Letter I book list! In Mañana Iguana, several animals want to have a party the following sábado, or Saturday. That means they have lots of party planning to do, from making and sending invitations, to stuffing the piñata, to decorating, and more. However, each time Iguana asks her friends to help her complete these tasks, they give her some kind of excuse, leaving Iguana to do everything on her own. With echoes of the classic story The Little Red Hen, Mañana Iguana includes a set of new characters, an updated story, and a Latino twist. It includes colorful illustrations and Spanish words interspersed throughout. Mañana Iguana is sure to delight your readers! This adorable board book is complete with the "itsy bitsy spider" rhyme, as well as four more classic nursery rhymes. As you read or sing the rhymes, your little one will enjoy touching, feeling, and tracing the cutouts on each page. With charming illustrations, this book is an excellent addition to your collection. Should I Share My Ice Cream? Is part of Mo Willems’s Elephant and Piggie collection (can you tell we’re Mo Willems fans around here?). In this delightful book, Elephant is faced with a big dilemma—should he share his ice cream? Readers will enjoy the fun illustrations, dialogue, and the surprise ending! Ultimate Explorer Field Guide: Insects is more advanced than many of our other National Geographic picks. It begins with a helpful section called “How to Use This Book,” which explains that the book is organized into two sections: insects that go through a complete metamorphosis and insects that go through an incomplete metamorphosis. At that point, insects are broken down even further by scientific classification. This book is an insect-lover’s paradise. Readers will be amazed at the cool facts and photographs of the myriads of insects included. 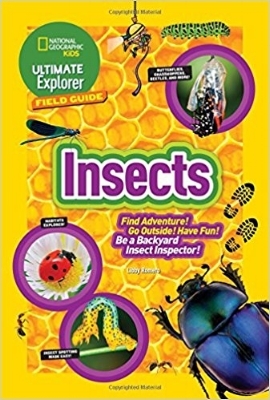 The Ultimate Explorer Field Guide Edition also includes an incredibly helpful “Quick ID Guide,” where readers can identify an insect based on a picture. Don’t be surprised if this encourages your little one to become a self-guided insect explorer! Iguanas is a great easy reader nonfiction text to supplement learning about the Letter I. It is organized into a few simple chapters, such as “Iguanas,” “Food,” “Baby Iguanas,” and “More Facts.” Each page includes simple text, with only 1-2 sentences per page. The fantastic up-close looks at iguanas highlight their amazing features. Iguanas is complete with a table of contents, glossary, index, and even access to a website with a special code so your child can learn more! Overall, it’s a great book to get your children excited about nonfiction, iguanas, and the Letter I! Whether or not you are a bug-lover, this book is fascinating. Its beautiful photographs showcase bugs up-close, spotlighting their amazing camouflage, how they eat, and much more. Chapters are organized by type of bug, including Rhinoceros Beetle, Chan’s Megastick, Praying Mantis, Honeybee, and others. Each page is also filled with photographs and diagrams highlighting various insect features, ‘Top Talents’ or ‘Secret Stars,’ along with a truckload of other interesting information! Complete with a table of contents, glossary, index, and further reading and website suggestions, Superstar Insects has no shortage of nonfiction features and amazing facts! We hope you’ve enjoyed our top 10 books for the Letter I! For more letter-themed ideas, including letter-themed crafts, snacks, and activities, check out our letter blog posts, like the Letter I post. And don’t forget to subscribe, so you can be the first to see our future letter book lists!! Check out our Letter R book list! We’ve included 10 great books, including fiction and nonfiction, to reinforce your child’s love of the Letter R! With vibrant colors and fun text, this book is filled with literal “holes” in the pages. Each hole exposes a word or two, and each turn of the page transforms those words into something new. What is “cream” on one page might become “scream” on the next. “Rain” might turn into “train.” And not only do the words transform, but each new page also transforms the cutouts themselves. A polka-dot hat suddenly transforms into a birthday cake, to name one such surprise. This book will delight both you and your little one! This book argues about whether the animal on its cover is a duck or a rabbit! With simple illustrations, the debate volleys back and forth, ultimately inspiring you and your child to have a fun discussion about who is correct. Not only does this book reinforce the letter R, but it will also reinforce D for duck. Double whammy! 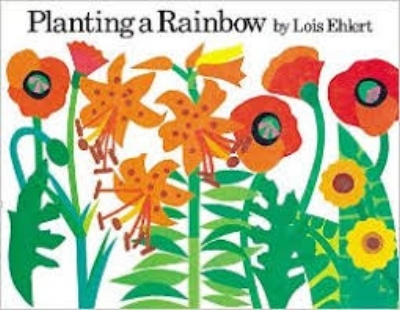 Planting a Rainbow revolves around a mother and child who plant a garden together. The book includes simple text paired with illustrations that are bright, bold, and colorful. Those illustrations often give more detail than what’s stated in the text, such as the various kinds of bulbs or the types of flowers listed on the seed packets. The story teaches the process of planting a flower garden, from planting seeds to picking out seedlings, to picking a colorful bouquet. Read this book when learning about colors, gardening, and especially the letter R! This alphabet book takes letter learning to a noisy level! 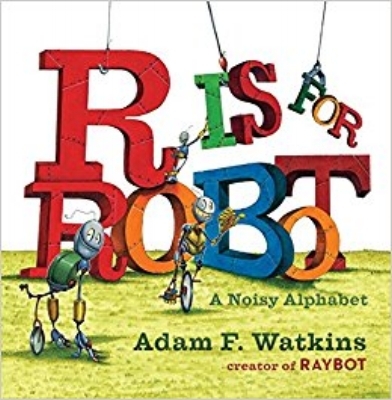 With a letter on each page, R is for Robot is filled with robots and noise words like “ooze,” “beep boop,” and “jolt!” Check out the illustrations to see what kinds of fun things the robots are doing—you might catch them practicing kung-fu, singing, tractor-pulling, or even breaking. This book is a must for your ABC shelves! As seen by the title, this book illustrates a version of the classic children’s song, starring an adorable kitten and puppy. It’s a fun book to either read or sing as it takes readers on a journey down a beautiful river into a rainforest. While the first lyric stays in traditional “row, row, row your boat” format, the verses quickly change from page to page, exposing readers to new lyrics about tigers, crocodiles, lions, and more. Not only that, but there are also lots of animal sound words included. And because the story winds down with Puppy and Kitty getting tucked into bed, it’s also a fabulous bedtime story. Grab this one when you get the chance! This sweet little book is a perfect sleepy-time read. Race Car Dreams follows a little race car through his post-race routine. After his bath, snack, and a book, Race Car is ready for bed and dreams of winning the next big race. The combo of darling pictures, fun rhyming text, and a cute story will lull your little ones to sleep with their own big dreams! Grab this book when you need a nonfiction text about the letter R. It’s full of colorful and interesting photographs, a map, and tons of interesting facts! It also includes simple text, perfect for keeping young readers interested and engaged throughout. Complete with a table of contents, glossary, suggestions for more rabbit books, and even a suggestion for a kid-friendly website, this book oozes text features. An added bonus is a final page of critical thinking questions that tie directly to the Common Core. You can’t beat this book! We’ve said it once, and we’ll say it again: National Geographic Readers can make any topic interesting. If your child isn’t a fan of rocks and minerals yet, they will be by the end of this book! Showcasing beautiful and colorful minerals, volcanoes, fossils, and even a cool diagram about the rock cycle, Rocks and Minerals is packed with engaging and interesting material. It even includes a cool section at the end called “Stump Your Parents,” with a seven question multiple-choice quiz based on info from the book. This is a great nonfiction choice for your letter R study! Who doesn’t like to ooh and ahh at a rainbow? With simple text and just a few short chapters, including “What are Rainbows?” and “Why do Rainbows Shine?” your children will learn about rainbows without feeling overloaded with material. They’ll also learn what a “sundog” is, what color “indigo” is, and how to use a “prism.” Critical thinking questions at the end will extend your child’s learning, as well as recommendations for further reading and kid-friendly websites to explore! Check it out! We hope you’ve enjoyed our top 10 books for the Letter R! For more letter-themed ideas, including letter-themed crafts, snacks, and activities, check out our letter blog posts, like the Letter R post. And don’t forget to subscribe, so you can be the first to see our future letter book lists!! Check out our Letter S book list! We’ve included 10 great books, including fiction and nonfiction, to reinforce your child’s love of the Letter S! This is a hilarious and adorable story about Bobby, a shark lover who tries to convince his parents to get him the coolest, most-awesome present ever: a shark! When he still doesn’t get a shark for his birthday, the story takes a fun twist as he learns to cope with the present he does receive. Not only does this book have a clever and original storyline, but we also love the pages packed with colorful illustrations! A great book to read when learning about the letter S! 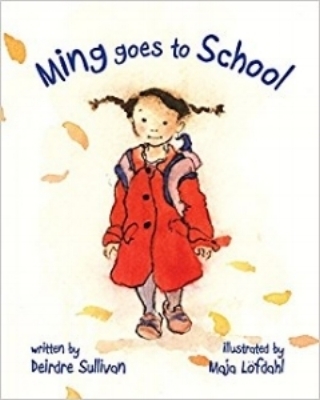 This sweet little story follows Ming as she goes to school. From saying hello to saying goodbye, giggles and rests, and pinkie-lifting tea parties, this book is sure to encourage your child’s excitement for all the great things school can offer. It also includes beautiful watercolor illustrations! This is an absolutely hilarious and adorable book! Immediately upon opening, readers will see a comical warning label, in which “Scaredy Squirrel insists that everyone wash their hands with antibacterial soap before reading this book.” While the rest of the book is definitely a work of fiction, it still includes comical diagrams, lists, advantages and disadvantages charts, a daily routine with clocks, an emergency exit plan, the contents of Scaredy Squirrel’s emergency kit, and even a schedule of Scaredy Squirrel’s weekly and predictable routine. It’s definitely a fun and original read! In How to Catch a Star, a little boy wishes he could catch a star, He not only comes up with a multitude of ideas for doing so, but he also sets out on plenty of adventures to accomplish his goal. While many of his ideas don’t work out, the story still ends with a sweet and tender moment. Young readers will enjoy his adventures and the simple but beautiful illustrations! This is a familiar and comforting story, using the beloved original song lyrics as its text. With a sparkly star-filled cover, charming illustrations throughout, and simple, bold text, this is the perfect book to read or sing with your little ones! In this classic story, Peter wakes up to a world full of snow! He quickly heads outside, where readers follow all of his fun adventures. From making different tracks in the snow to smacking snow from a tree and pelting the enemy in a snowball fight, readers will enjoy (and perhaps relate!) to his actions as he enjoys his day in the snow. A favorite in the middle of the winter, this is also a fun book to read with slushies in hand in the middle of summer! Is your child full of questions? Are they intrigued by sharks? If so, this book was made for them. Sharks! is packed with up-close photographs of these amazing (and terrifying!) creatures, not to mention tons of fascinating information. It also includes definitions of new words scattered throughout the text, as well as a picture glossary at the end to help young readers learn and understand content-related vocabulary. This book is a level 2, which may mean your little one isn’t ready to read it independently just yet, but it provides a great read aloud for both parent and child to enjoy together! The Story of Snow takes readers through the process of how snow is made—starting as a tiny speck, growing into a crystal, and finally falling to the ground. It also combines plenty of other facts and details about snow with beautiful photographs of snow crystals that even adults will find mesmerizing. At the end, it gives tips for catching your own snow crystals! While it doesn’t include all the nonfiction text features you’ll see in many of our other nonfiction selections, it is still worth the read, especially when learning about the letter S. Both you and your child will finish it with a greater appreciation for the wonder of snow! Reading more like a story, I’m Trying to Love Spiders is a perfect choice for every non-spider-lover out there! Readers will learn all about how fascinating and amazing spiders really are. There may also be a few hilarious accidental “spider squishings” along the way, as the narrator attempts to overcome her own fear of the crawly critters. When it comes to illustrations, the watercolors effectively direct the reader’s attention to the spiders. Overall, this is a clever nonfiction book that many of us can relate to! We hope you’ve enjoyed our top 10 books for the Letter S! For more letter-themed ideas, including letter-themed crafts, snacks, and activities, check out our letter blog posts, like the Letter S post. And don’t forget to subscribe, so you can be the first to see our future letter book lists!! Check out our Letter M book list! We’ve included 10 great books, including fiction and nonfiction, to reinforce your child’s love of the Letter M! My Teacher Is a Monster is the hilarious story of a little boy who is convinced his teacher is a monster. Ultimately, he attempts to forget about his “teacher problem” by going to the park. He’s in for an awkward surprise, however, when his teacher shows up! Your children are sure to enjoy this comical story and the transformations that take place. It’s a great reminder of how perceptions change, due to time and/or experiences. Who knew a book with only one repeated word could be so entertaining? Moo! is especially great as a read-aloud text, provided you pay attention to how each “Moo” is depicted in the text. It’s the fun story of a cow that finds a car for sale and takes it for a spin. The adventure, hilarious illustrations and excessive “Moo-ing,” not to mention the surprise ending, make Moo! a must for your bookshelf! The story starts simply enough: a woman has a son who eats some weird things. Then she calls in a doctor, a nurse, and the lady with the alligator purse. They each take a turn diagnosing and treating the boy, and their antics lead up to a fun ending. Even though this is a quick read, this could easily become a story your child will want to read again and again! Mustache Baby is a giggle-worthy story about a baby born with a mustache! Once born, a nurse wisely advises the family to wait and see “if this mustache is a good guy mustache, or a bad guy mustache.” While mustache baby Billy performs good deeds throughout much of the story, trouble brews when his mustache turns into a “bad-guy mustache.” The book reminds us that we can be a good guy or bad guy, and even have moments of both within a day. But, it concludes, we can always change ourselves and our actions for the good! In Mouse, an adorable mouse shares a cherry with the letter M, a talking character complete with eyes, eyebrows, and a mouth. As the M and the mouse interact, M transforms into various letters, and ultimately the duo become unlikely friends. Full of dialogue, alliteration, and interesting vocabulary, Mouse will not only reinforce the letter M, but other letters as well! When his goose friend leaves for the winter, Duck finds himself alone and lonely. So he makes his way around the farm in search of a new friend. When each animal asks him to play their own version of “duck, duck, goose” (such as “duck, duck, pig”), the grumpy, lonesome duck refuses to be consoled, instead exclaiming, “I can’t wait until Goose gets back!” Check it out to discover the happy ending. It’s a lovely story about overcoming the grumps, finding and making new friends, and enjoying new games and activities! This is another great read—or sing!—aloud text for your little ones! With fun illustrations, engaging text, and a hilarious surprise ending, this cute version of the classic rhyme is delightful. Check it out! Starting at 1 and continuing up to 12, along with a bonus page of ‘‘too many to count,” this book is full of beautiful photographs, interesting animals, and lots and lots of counting! With a different animal on each page, your child will not only see and count moose, but they’ll also see cougars, auklets, dall sheep, bears, and more! And with a fun fact or two on each page, both you and your little ones will learn all about these unique and amazing animals! While this National Geographic series is a bit long for really young readers to read through, they are still great for any age, as parents and/or children can pick and choose chapters that are interesting to them. Children will love all the awesome photographs and cool facts about monkeys, and parents will appreciate all that their children will learn! Each page is stuffed with information and photographs. Many photographs also include labels, and many pages include small sections of “Monkey Talk,” where readers can learn new words, like ‘habitat,’ thanks to definitions written in kid-friendly terms. And did we mention the maps, the ‘Stump Your Parents’ six-question quiz, and the picture glossary at the end? There’s even a photographic chart that highlights the differences between apes and monkeys! Whew! Obviously, this is a great nonfiction choice to reinforce the letter M.
What is a magnet? How does it work? All this and much more is answered in A Look at Magnets. With chapters such as “How Magnets Work” and “Magnets at Work,” it shares oodles of interesting info. After reading this book, your child will better understand the role magnets play with regard to compasses, MRI machines, and even in the Earth itself. There’s a good chance your children will be inspired to play with magnets for the rest of the day— but that's a fun activity in itself, so why not? We hope you’ve enjoyed our top 10 books for the Letter M! For more letter-themed ideas, including letter-themed crafts, snacks, and activities, check out our letter blog posts, like the Letter M post. And don’t forget to subscribe, so you can be the first to see our future letter book lists!! Check out our Letter T book list! We’ve included 10 great books, including fiction and nonfiction, to reinforce your child’s love of the Letter T! This is a fun twist on the original Old MacDonald song. In this version, Old MacDonald had more than just animals. Your child will be surprised to learn he had an excavator, front loader, bulldozer, and more! Each machine reference includes its own sounds, like a “scrape rake” here or a “squish smash” there. Check this book out to read or sing, and get ready to laugh! In this story, a lonely giant turtle lucks out when shipwrecked visitors take refuge on his shell. Unfortunately, they can’t stay forever, and the giant turtle fears he’ll be alone for good. With a happy ending, fun illustrations, and a reminder of the importance of family and friends, this book is sure to be a winner on your shelf. Steam Train, Dream Train is a great way to expose your children to rich vocabulary words! It is packed with rhyming words, sound words, and verbs, as well as train-related words like gondolas, tankers, boxcar, and more. And once you’re hooked, the Steam Train, Dream Train series also includes books that teach about colors and numbers. The fun story and colorful illustrations of trains and animals (and even some dinosaurs!) will definitely be a hit with your child! This simple board book makes for an easy but fun read for you and your little one. It not only showcases different body parts, but it also encourages children to do the actions in the book (Woot, woot! ), such as “touch your ears, make them wiggle.” It may be short, but it’s a great way to learn about body parts and do a little moving, too! This book will excite not only train lovers, but any child in need of a bedtime story. It’s the perfect sleepy-time book, complete with fun phrases, lots of sound and train words, and beautifully illustrated pictures with engaging human and animal characters. 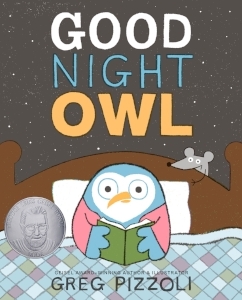 The story takes the reader through the Goodnight Train’s nightly routine as it tucks everyone in, travels to Sleepytown, and finally arrives at its own home. This is the perfect book to add to your bedtime story collection, as its gently rhythm will hopefully make your little ones sleepy, too! This fun and silly story tells the tale of a monster from Planet Tickle who comes to share his great tickling talents. The book is filled with silly words, fun language, quirky sounds, and a bit of suspense and surprise as to where the Tickle Monster will want to tickle next! Beware— Tickle Monster definitely encourages tickling “adorable footsies,” “underarm-pitties” and more! The book ends with a nice sentiment of love, making it a great one for parents to share with their little ones. Talk about a gorgeous book! Tree showcases an apple tree as it varies through the seasons, from spring to summer, fall, winter, and finally back to spring once again. The illustrations are rich in color, with adorable tiny cutouts that expose what’s hidden inside the tree. With colorful pages, pictures, animals, and descriptive language, this book is sure to impress. This book is is part of a terrific “What if?” series. In this case, the reader imagines they’ve lost their two front teeth, and then imagines what it would be like if animal teeth grew in instead! Each two-page spread showcases the teeth of a different animal, including a photograph of the animal, an up-close photograph of their teeth, a quick description about their teeth and purpose, and a fun fact. It also includes an illustration of a child with that set of animal teeth! Kids can read these books cover to cover or skip around to find the animals that interest them. As an added bonus, it ends with tips and recommendations for human teeth care, along with a fun page that answers the question “Where do teeth come from?” Your children will love learning all about teeth with this book. Once again, we love the National Geographic Readers because they are a fantastic way to research new topics with little ones! In the nonfiction book, Turtles, you and your young reader will learn all about these amazing reptiles. With tons of cool facts, interesting and beautiful photographs, and simple and engaging text, it is a great book to read when learning about the Letter T.
Like we’ve said (over and over! ), we can’t get enough of the National Geographic Kids’ series! The Explore My World series reads more like a story, sharing oodles of interesting facts (about tigers, in this case) along the way. As we’ve come to expect from National Geographic, there are also plenty of beautiful photographs to illustrate the text. This book is a great way to learn about tigers, their behavior, how they communicate, and even how they play—oh, and it reinforces the letter T sound besides! We hope you’ve enjoyed our top 10 books for the Letter T! For more letter-themed ideas, including letter-themed crafts, snacks, and activities, check out our letter blog posts, like the Letter T post. And don’t forget to subscribe, so you can be the first to see our future letter book lists! !